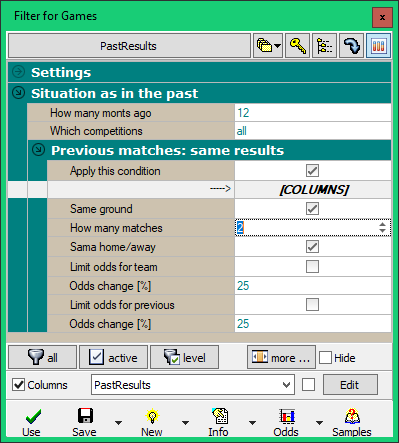 This page illustrates the use of the filter function for the Offer window in the "Situation in the past / Previous matches: same results" section. Using this feature, you can get the balance of matches (winnings / ties / losses) in past team matches if these matches were preceded by the same situation as they are now. The same situation is defined in this case by the same result of one or more previous matches. So, for example, how the team played in the past the next match if the previous two matches lost. Setting this feature allows you to specify not only the number of past results surveyed, but also to determine whether the matches in which the balance is counted (ie those matches that follow the same result) played the team the same ground home / away as the match at which the balance is calculated. So, for example, we can determine that we are interested in the balance of HOME matches after two previous winnings. Watching the match environment affects the SAME GROUND item. Similarly, it is possible to set the matches in which we compare the result with the current previous match to be played the same at home / away as this current previous match. So, for example, we can watch the situation when the team won its last game AWAY. After activating the "SAME HOME/AWAY" option, the team will only be matched when the team wins away (and not the winnings at home). Additional restrictions can be activated for team odds. Both in the matches from which the balance is counted (the LIMIT ODDS FOR TEAM option on the team) and the matches we are looking for (the LIMIT IDDS FOR PREVIOUS option). Both choices also include a specification of the deviation to which the odds are to be compared with the current match, respectively, currently playing. Then we can watch the team's balance after winning out, when the odds for the team was similar to the previous match, respectively, the balance of the following matches, if the odds was similar to the one on the match currently being analyzed. This avoids distortion of the balance sheet data from matches where very different odds have been set compared to the current situation. .. 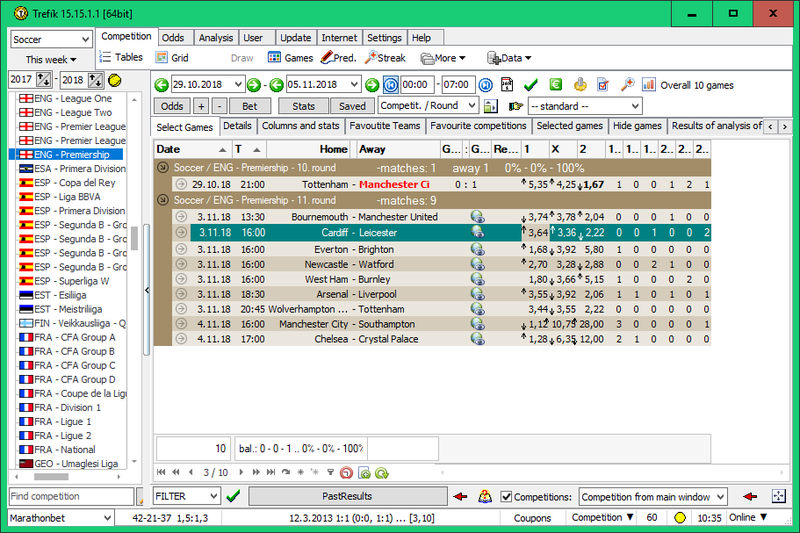 The "1-Result" items for the home team (number 1) indicate the previous match (minus sign) with the same result: separately the winnings (+), ties (=) and loses (-) in the following match. The "2-Result" entries contain the corresponding values for the visiting team (number 2). .. we can see that Cardiff lost its previous game and it was played away. For this team (home team), the filter shows the balance from the HOME matches played right after the away lost. So we get the balance 2 - 2 - 2 which corresponds to calculated data at the Offer window. In addition, we will try to modify the filter slightly to count the balances only from matches with similar odds to the current situation. .. it is newly set to count them from matches where the odds for team was +/- 25% from the currentl odds for the team in the analyzed match, ie 3.64. .. the balance 0 - 1 - 0 for Cardiff. The only one corresponding match is: 18.08.2018 Cardiff - Newcastle with the odds 3.42 for Cardiff. That match finished 0:0. 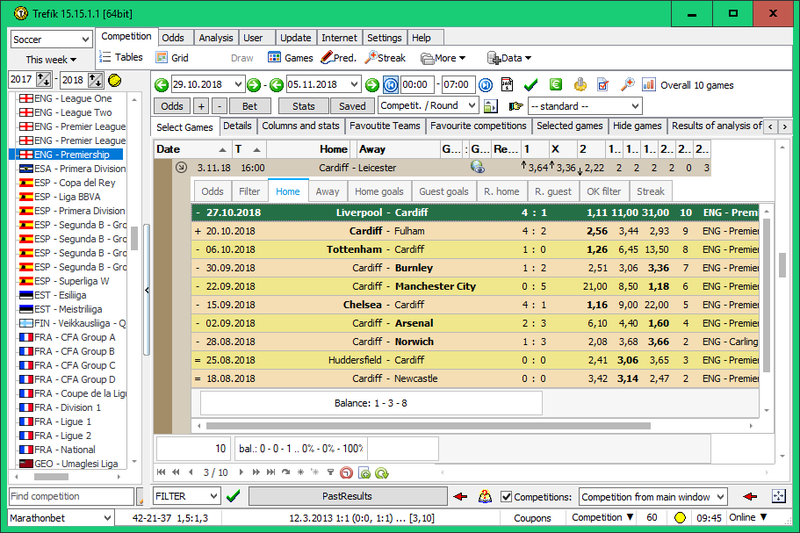 Another modification of the filter (activation of LIMIT ODDS FOR PREVIOUS item) is limited in the Cardiff search for away lost matches with odds for Cardiff similar to 31.00 (which is the odds at the currently previous match played in Liverpool). The tolerance is again 25%. .. so the restriction for the odds is too strong as Cardiff has the balance 0 - 0 - 0 now. Similar balances are available also for guests. Calculated statistics can be further processed, compared to either team or used for filtering the displayed matches. The statistics shown are characterized by the fact that each team is affected by the team previous result. It can be a balance after a win, a tie or after a loss. If you need to know the outcome of the next match analysis, you can get the previous result in a separate column using the Filter / Shape feature.